If you have considered adding whole grains to your baked goods, this is a perfect book to get you started. 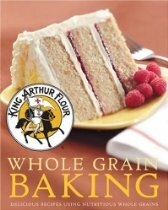 Written by King Arthur Flour Company, this 600-page book is full of recipes, tips, and information about baking with whole grains. This comprehensive volume received a nomination in 2007 from the James Beard Foundation in the Baking & Desserts Book category, one of just three baking books recognized. The book has chapters on breakfasts, quick breads, crisps, flatbreads, yeast breads, sourdough, cookies, cakes, pies, and pastries, as well as sections with information about the grains and weights of various ingredient used in the recipes. Recipes make use of whole wheat, oats, corn, barley, rye, spelt, buckwheat, and brown rice. All of the recipes were tested in the King Arthur Flour kitchens, and while many of the recipes use whole grains exclusively, a number of the recipes retained some white flour, either unbleached all-purpose or bread flour, if needed for texture or rise other considerations. 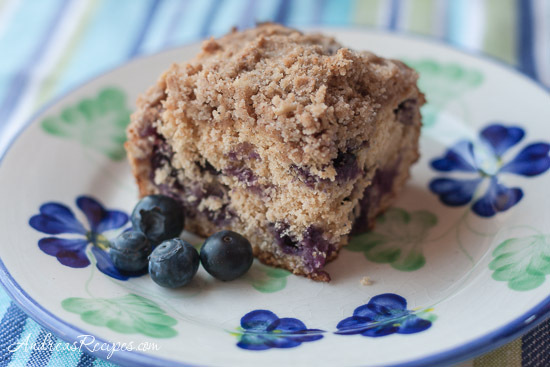 For our first recipe we tested the blueberry buckle, made with white whole wheat flour, whole wheat pastry flour, and a little unbleached all-purpose flour. The flavor was good, quite sweet, and the texture, while denser than a typical white flour coffee cake, wasn’t chewy as I had expected. We are eager to try more of the recipes as we work towards converting our baking to whole grain.